Obesity is becoming a serious social problem not only in developed countries, but also in other parts of the world such as the Asia-Oceania region. 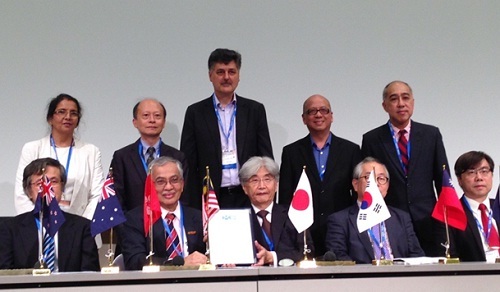 Emeritus Prof. Dr Mohd Ismail Noor, President, Asia-Oceania Associations for the study on Obesity (AOASO) has facilitated in helping to get the "Nagoya Declaration 2015" on obesity signed during the8th Asia-Oceania Conference on Obesity 2015 (AOCO) in Nagoya, Japan. The AOCO conference is organised by Asia Oceania Association for the Study of Obesity (AOASO), and consists of its 12-member organisations drawn from across the region – they include AIAARO (India), ANZOS (Australia and New Zealand), HKASO (Hong Kong), ISSO (Indonesia), JASSO (Japan), KSSO (South Korea), MASO (Malaysia), SASO (Singapore), PASOO (The Philippines), TMASO (Taiwan) and TSSO (Thailand). Prof. Soon (Korea), Prof. Huang (Taiwan). This year's conference attracted over 280 attendees from the twelve countries, and provided an opportunity for academics, students, healthcare professionals and scientists to exchange ideas on obesity research, prevention and management. This important declaration focuses on how to tackle and treat obesity. AOASO now plans "to disseminate the concept of “obesity disease” worldwide thereby ensuring that all individuals with “obesity disease” are appropriately treated as well as to promote the development of new treatment modalities and approaches". The organisation hopes that the campaigns outlined in the Nagoya Declaration "will contribute to increased healthy lifespan, more effective medical resource utilization, and alleviation of the increasing burden of obesity and “obesity disease” on the international community". For the full text of the Nagoya Declaration click here.